Major Millions slot machine from Microgaming is one of the progressive jackpot slots in the game catalogue, and features the a cartoon Major and a military theme. The mobile slot is a pretty simple title, with 5 reels, 15 paylines and a standard jackpot of 1,000x, although the average progressive jackpot is about £350,000, so well worth having! For all the information about the game check out the full Major Millions slot review below. If you’re looking for a simple mobile slots experience that still has the potential to award life-changing payouts, the Major Millions slot is arguably one of the most decorated games still in the field of combat. 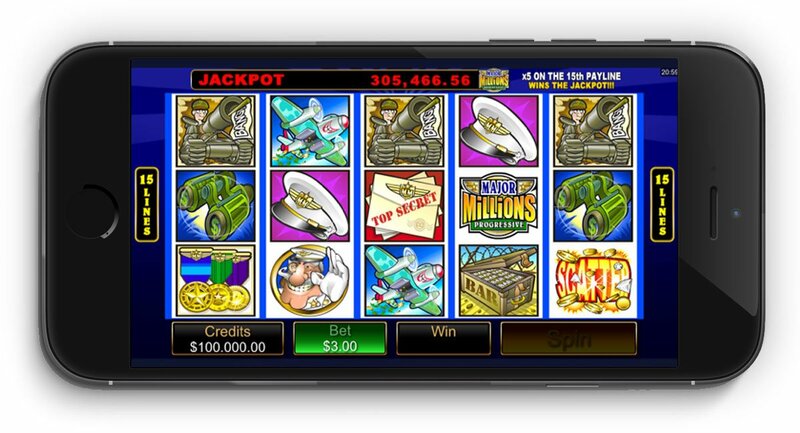 As you’d expect from the name, this five-reel, 15-payline slot is a military-themed game with medals, planes, tanks and ships featuring instead of the usual playing card symbols. However, despite its promising title, the progressive jackpot in the Major Millions slot machine regularly dips below the seven-figure mark. In truth, the slot has attracted a mixed reception from players due to its high volatility and low returns, with users banking on hitting the progressive jackpot to justify their time. Nevertheless, the game does boast a regular jackpot payout of 1,000x your stake and several wild/scatter symbols. Playing the Major Millions slot is easy and its basic layout and lack of bonus features does at least mean that the game ports seamlessly to a mobile device. The Major Millions logo acts as a wild and can be substituted for any symbol, with the top payout achieved by matching five wilds on the 15th payline. All wins that contain a Major Millions symbol are tripled, while “scatter” symbols award a cash payout if three or more appear anywhere on the game board. Obviously, the more scatter symbols that appear, the bigger your reward, but even the maximum scatter win is capped at 50x your stake. While the average progressive jackpot win is £375,426 and comes around roughly every 72 days, the high 10.63% house edge and absence of free spins or multipliers make it a very difficult slot to profit from regularly – so unless you’re in for the long haul, your money may be better invested elsewhere. Having been around since 2009, the Major Millions slot has definitely earned its stripes – but a relatively low progressive jackpot and high house edge mean it’s probably time for the game to hang up its rifle. Like the Major Millions slot review? Check out these as well…..